Blerekvatnet is a lake in the municipality of Rana in Nordland county, Norway. 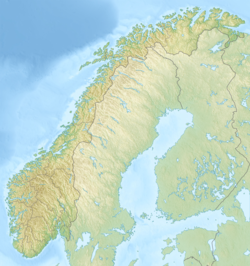 It lies at the northern base of the mountain Junkerfjellet, about 40 kilometres (25 mi) straight east of the town of Mo i Rana. ^ "Blerekvatnet" (in Norwegian). yr.no. Retrieved 2011-12-19. This page was last edited on 7 February 2019, at 20:24 (UTC).